This weekend! Sugarloaf Crafts returns to Edison at the NJ Convention & Expo Center. Sugarloaf's BIGGEST NJ festival ever! Nov. 9-11, for 3 days only, #ShopSugarloaf for the most unique holiday gifts, home goods, specialty foods, and more. More than 300 of the country's most talented artisans can't wait to meet you. 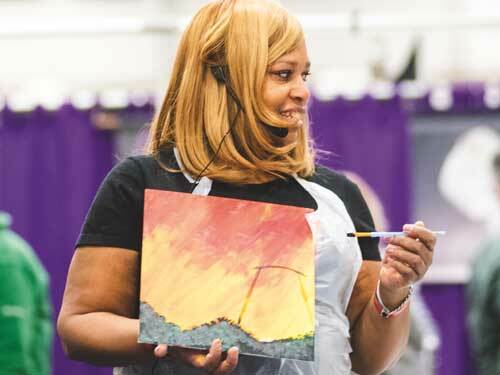 Don't miss your chance to be the artist with our FREE painting classes, plus live art demos and kids' theater. Don't miss out on the fun! Plan Your Visit to Sugarloaf Crafts! Sugarloaf's Shopping Guide features new designs and special deals from some of our top exhibitors. Get going on your gift and holiday shopping! Be an artist! Try a FREE "Learn to Paint" class this weekend with Sugarloaf fine artist Kathy Small. Create a memory to take home with you. Check the schedule and sign up at the show! You'll have a chance to meet more than 300 talented artisans this weekend. Here's a look at some of our favorites! Liz Lubansky's stunning ceramic sculptures capture the beauty of ocean life. Come see her work in person this weekend; we know you'll love it! Fashion designer Elizabeth Swanson's lifelong love of sewing shows through in everything she creates. Her vibrant color schemes and high quality fabrics blend together perfectly. A perfect gift! Looking for the "write" gift? Turner Mastercraft's handmade pens, letter openers, and other desk accessories are a must see this weekend! We're excited to be back in NJ! Invite your friends and share this special shopping experience with us. Keep in touch! Follow @SugarloafCrafts on Facebook, Instagram and Twitter for all things handmade. We'll see you at the show! Older PostSugarloaf Crafts this Weekend - Oaks, PA: Preview + Discount Tix + FREE Painting Class!